The Lunar Chronicles is by far one of the best series that I have read this year. At the time that I am writing this review, I have already completed Scarlet and I am beginning Cress, the other two books that are in the Lunar Chronicles. I have to say that I am very, very, very impressed with each and every one of these books. Let's start with Cinder. 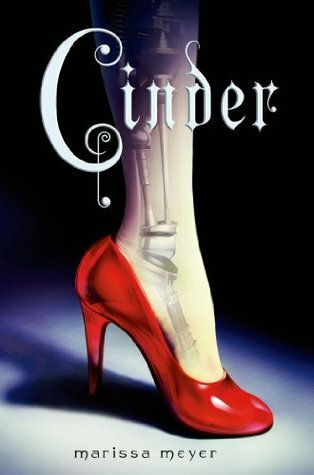 Cinder is a retelling of the fairytale of Cinderella, with the prince, the step-sisters and the "inferiority" that her family makes her feel. However, this retelling is a little bit different. There are no singing mice, no pumpkins that turn into horse drawn coaches, and no glass slipper. There are, however, wars that are being threatened, plagues that are killing thousands and "segregation" of classes. Cinder is also a cyborg. One of the first things that I liked about this book is the fact that it is not a classical "re-telling" of Cinderella, where almost everything that occurs throughout the novel stays the same as the original story, with just a couple of twists. Cinder was different. Meyer writes so much of her own story within the "retelling", and had I not known the story of Cinderella, I would have said that this is completely her own story. I actually believe that it is, with minor but sometimes clear influences on the plot of the story itself. This books is not a "retelling" of Cinderella, this book is not about a prince saving a princess. This book is about Cinder, one of the best female characters I have ever read about. This book is about Cinder, a girl who will do anything that she can to protect her family. This book is about Cinder, a cyborg who does not know that her life is about to change. The way that these "archetypes" of characters that are seen in Cinderella are brought up within the story of Cinder is also an object that I found of the utmost importance. In the story, these "archetypes" are brought up briefly and subtly. One of the characters that I saw this happen with was Adri, Cinder's step mother. Do not get me wrong, one can obviously see where all of the hostility comes from, in terms of the real story of Cinderella and the character of the step-mother. But, what intrigued me most about her entrance into the story is that only bits and pieces of her character were revealed at one time. Meyer does not come out and say that "Adri is based off of the evil step-mother in Cinderella", but she leaves the reader thinking and able to figure it out for oneself, while also adding enough of her own interpretation of the "archetype" for the reader to realize that, they may be similar in terms of origin, but they are also vastly different. Meyer has a way of making these characters her own. Meyer is also able to bring in social issues that are still relevant today throughout the story of Cinder. One of these "social issues" is seen through the portrayal of Cinder. She is, of course, a cyborg, and there are several instances where Cinder is mocked, teased or looked down upon because of her "cyborg status". Cinder really did not have a choice in the matter of whether or not she wanted to be a cyborg, and this event and portrayal is hurting her. People will not go to her business, even if she is the best mechanic in New Beijing. People will not socialize or talk with her, and it is considered a sin if any of the cyborg residents were to go to any of the Royal events. The sad thing is that none of the other characters are really there for Cinder, except for those who are in the same situation as her - being labeled as a cyborg. What I loved about this is that, not only does it allow the reader to emphasize and connect with Cinder, but it allows anyone to be able to identify with her story. Those with physical, mental or emotional challenges can identify, and those without can as well. Adults as well as children can identify, and a reader can likely see someone that they know personally within one of the other characters, if not Cinder herself. I truly believe that this part of the book was amazing. I also loved that the "social discrimination" could be applied to any real world situation. There was a point in history when segregation was occurring and was viewed as moral, and there were also other instances in history where certain groups did not have their rights because the country thought it was okay as well. The sad thing is that this is still going on in society today, and Meyer pulls from these events to say "HEY! Don't let this happen again, but if you are in this situation, you can get out of it." The funny thing is, is that everything that I have said previous likely has nothing to do with the 100% central purpose of the novel. To be honest, I did not think of these things right after I finished the novel. I was thinking about the characters, the plot, and what would happen in the next book and when I could get my hands on it. But if you really think about it, this is just as central as those main ideas, because they are just as important both as a writer, and in the real world. Onto the more "traditional" parts of a book review, I would like to talk about the characters and the plot in general. I will not go into every single character, but I was really pleased to see that no one character is perceived as perfect. Each and every character within this story has his or her own faults, mistakes, and struggles they are going through. However, each and every character also has the one thing that makes them feel strong, the one thing that they can act against. Each and every character has hope and determination. This is what I love about this story, because these emotions are important in the real world as well. Also, these emotions and these feelings allow readers to better connect with the story, to empathize and understand and relate to each and every one of these characters. The plot was by far one of the best aspects of the book. Meyer knows how to make something her own, how to intrigue readers and how to spin the story when you least expect it. Meyer creates a world that you never want to leave. It really is that simple. The world and the plot compliment each other, and it makes this book an easy read. I actually finished this book in one day. I never wanted to put the book down. The plot was perfectly paced for me, and it was also balanced with character development and setting up different ideas of the story. This plot was spectacular. With that, I am going to end the review. If you love sci-fi, or fairytales, strong female leads, strong male characters, and even medicine, I would read this book. Everyone has something that they will like in this book, and you will never want to put it down. Meyer has a way with words that leaves every reader awestruck. I have all three books on my bookshelf but I'm really hesitant about reading it. I almost always hate fairytale retellings, and I don't want to screw up my chances with these books! In my opinion, the story is almost completely different from a "classical" retelling of Cinderella, but there are certain parallels to it that appear in the story, such as the character of Adri that I wrote about in my review of the book. The majority of the story, in my opinion, is not really focused on the "retelling" aspect, and there is definitely enough "new" content to the story to make it this way. It is really up to you from there, so I would definitely say to go with your instinct! I'm glad you're loving this series! I agree that the plot is spectacular. The author has done a good job with it throughout the series. I love how well developed the characters are. Other than the creativity of the story, that's probably my favorite part of Cinder and the other two books (I'm almost done with Cress). Great review! Thank you! Yes, this series has to be one of my favorites! I love both the plot AND the characters, as well as the creativity of the story, just like you! Now, all we have to do is wait patiently for Fairest and Winter!